On April 5th, we traveled to Loyola University in Chicago, IL for NUBC 2014. Our team competed in four preliminaries, one semi-final, and the final rounds. We racked up more points than any other team all day, and we got second place in the country! We lost the final round against Loyola's team by only one point! Read more about the regional competition here. On November 9th, we competed at Clemson University for the regional competition of Ethics Bowl. At this regional, 14 teams competed. We made it to the semi-final rounds, and we won fourth place overall! Read more about the regional competition here. 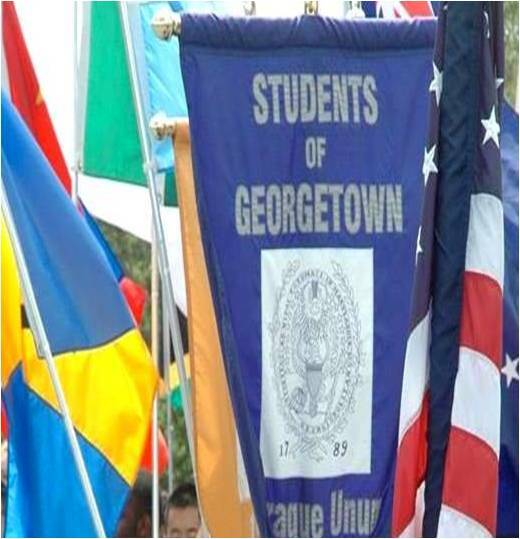 Georgetown hosted the NUBC in 2013! From April 5th-7th, our team competed against 15 other teams in Bioethics Bowl. We have always been very successful at this competition--getting second place in 2011 and 2012. This year we took home the first place trophy! You can read more about the competition here. On February 28th, our team traveled to San Antonio, TX to compete against some of the best teams in the country. The competition was part of Association for Practical and Professional Ethics' Annual Meeting. We had a great time showing off our hard work and touring the historic city together. Read more about this competition here. On November 10, we competed at the University of Baltimore for the regional competition of Ethics Bowl. At this regional, 14 teams competed. For the first time, we took home the first place trophy! We are heading to Nationals in February in San Antonio, TX! Read more about the regional competition here. Elizabeth Bakacs (Pre-med, Math major) has been Team Captain since the beginning (Spring 2011), and she will be graduating in Spring 2012. She has shown enormous dedication, and her case presentations have received high scores in every competition. In recognition of her achievements, Elizabeth was awarded Georgetown's Stephen F. McNamee Ethics Award: "This award was founded by Dr. Ernest R. S. Witten, C’1938, M’1944, in 1977 to honor Rev. Stephen F. McNamee, S.J. The award is presented annually to the Georgetown College senior who has demonstrated outstanding scholastic achievement in the study of philosophical ethics." Congratulations, Elizabeth! Well-earned and well-deserved! The University of Denver hosted the 2012 National Undergraduate Bioethics Conference March 23rd-24th. A total of 16 teams competed from around the country, and we finished in second place! Read more about this competition here. We were one of four Mid-Atlantic teams that competed in the national competition on March 1, 2012 in Cincinnati as a part of the Association for Practical and Professional Ethics' 2012 21st Annual Meeting! Including Georgetown, 32 teams from around the country competed. Of all of these teams, we finished in tenth! We had a 2-1 win record in the preliminaries with a +14 point differential! Read more about this competition here. The Washington Post: "Region's Schools Square Off in Ethics Bowl"
Team Captain Elizabeth Bakacs was interviewed for this article on the 2011 Mid-Atlantic Regional Ethics Bowl competition! The 2011 Mid-Atlantic Regional Ethics Bowl competition was held at the University of Baltimore on November 19th. Our team traveled thanks to generous contributions from the Georgetown Philosophy Department. Of sixteen teams, we took second place! We WILL be heading to Nationals!Read more about this competition here. The 2011 Bioethics Bowl Competition was held at Duke's National Undergraduate Bioethics Conference from March 18th-20th. Our team, formed in January 2011, traveled to Duke thanks to generous contributions from Georgetown University.We took second place! Read more about this competition here.